Let me tell you something! This lady is in my opinion the epitome of class, style and knowledge. Not only she was present when this whole woodturning movement started, but she has been able to make some major contributions to the industry. 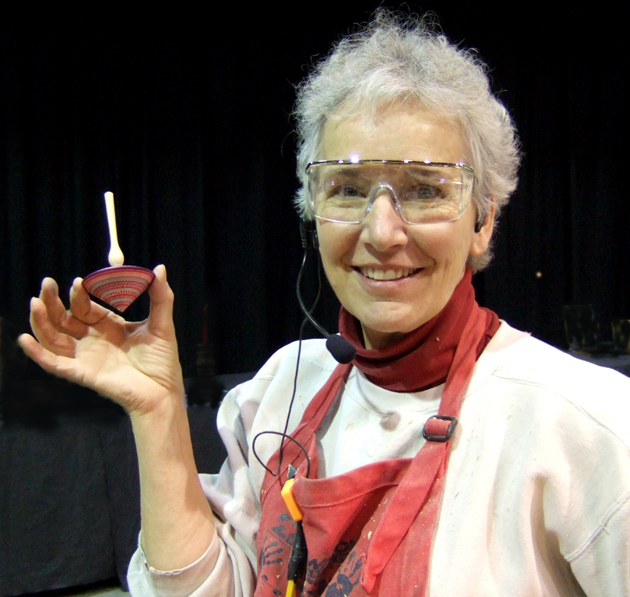 Bonnie has been involved with woodturning since the early 1980’s, attending most of the major woodturning symposiums for over 25 years. In 1986 she designed the small Klein Lathe which has been in production for over 20 years and it was the predecessor of the new small lathe wave. In 1992 she introduced the Klein Threading Jig as an accessory to the lathe for cutting threads in wood. Bonnie produced 5 turning videos which have now been converted to DVD’s and in 2005 wrote a woodturning project book. Although her threading jig has been imitated, Bonnie was the first woodturner to introduce such a unit. Her popularity as a demonstrator and educator has resulted in invitations to countries around the world, as well as all around the USA. In recent years she has been a featured demonstrator in several International Symposiums – in South Africa, Canada, the UK and Australia. In 2003 the American Association of Woodturners awarded Bonnie with an AAW Honorary Lifetime Member in recognition of her contributions to woodturning. “I turn for the love of the creative process. I am addicted to discovery, progress, and the fact that perfection is forever elusive but, as I strive for it, yesterday’s challenges become the basic skills of tomorrow. I love the distinct smell of the various woods, the sound of the shavings as they are cut by a sharp tool, and how quickly a form appears from a block of material. In the past I have enjoyed many other crafts – spinning, knitting, weaving, basketry, etc, but not only for the tactile sensations. The aroma of spinning “in the grease”, the smell of wet reeds for a basket, the sound of a shuttle or the clicking of knitting needles all contributed to the satisfaction of making something. Experimenting with turning unusual materials such as bone, plastic, tagua nuts, aluminum and horn has led to many more interesting sensations for the eyes, ears, hands and nose. I am honored to be her friend and I am humbled by her knowledge!